"Sometimes Delta has saver award space for married segments but not for the individual segments. I've seen this frequently with gso-dtw-buf. I'm curious whether Skypass sees the individual segments. I'll try it, but curious if you came across this already?" A year ago I wrote about being able to piece together low-level Alaska redemptions on Delta by entering segments individually in a multi-city search, so I knew that it used to be possible, at least with that one partner. The question is whether it's still possible in general and still possible with Korean Air in particular. The good news is, it is. As was the case in my post last May about using Alaska's multi-city search tool, you do have to use the Korean Air multi-city search tool — a simple roundtrip search did not return the desired routing. 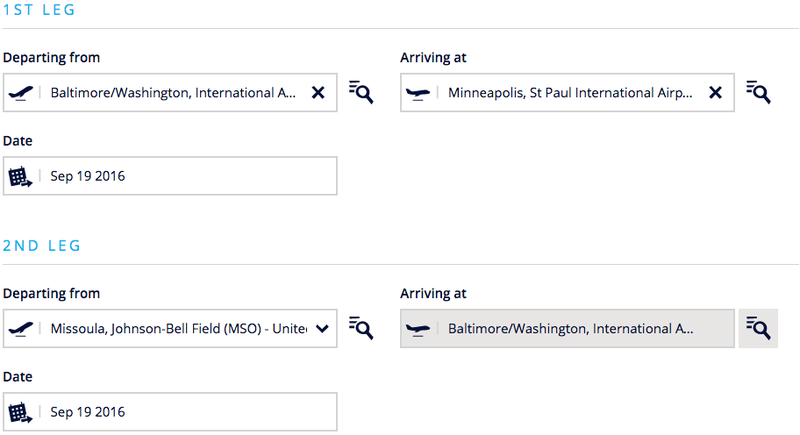 If the route you're flying is one targeted by Delta for price gouging, you'll naturally want to know if you can piece together segments in both directions in order to secure low-level space and your preferred routing on the entire trip. Korean Air's award routing rules seem to be written in machine-translated Korean, so I don't have a firm grasp of whether a stopover is allowed in each direction and the manually selected segments use up that stopover, or whether the connections are so short that they don't count as stopovers, meaning you could also add one or two stopovers. This would be extremely valuable if you lived in Detroit or another Delta hub, since it would mean you could get up to 4 unrelated one-way flights to and from your home airport for the price of one roundtrip. Again, I just don't know if that's the case or not, but if you have experience piecing together such itineraries, be sure to let me and other readers know in the comments! In case you've been staying in a buddhist travel hacker monastery for the last week, the big news to come out of the loyalty world this week was the unannounced addition of Flying Blue, the loyalty program of Air France and KLM, as a transfer partner for "flexible" Chase Ultimate Rewards points. This post is going to come across as a bit cynical, so in the hopes of heading off sniping in the comments, let me first explain why this is phenomenal news. While it's true that Ultimate Rewards already had transfer partners in oneworld (British Airways), Star Alliance (United), and Skyteam (Korean Airlines), Korean Airlines SKYPASS is a notoriously complex program to work with, with the gaping drawback that you can only book award tickets for relatives — and if you take them at their word, that even excludes stepchildren! By contrast, Flying Blue has an online award search engine that allows you to book award tickets for anyone you like (as long as you don't get caught in one of their fraud traps). Any expansion of a loyalty program to include new ways to earn or redeem points is an objective positive. If I never book a Flying Blue award ticket, I'll still be glad to know that it's someone's job at Chase to hunt down loyalty programs, negotiate transfer agreements, and implement the technology required to expand our Ultimate Rewards redemption options. To me that's a sign that the program still has a degree of vibrancy and is not yet ready to stagnate, like American Express Membership Rewards. With that out of the way, let's talk about Flying Blue redemptions. To understand how difficult it is to redeem Flying Blue miles on Delta, it's important to understand how Delta makes award space available to its own members and to partners. Unrelated to SkyMiles pricing for their own members, Delta makes some seats on some flights available to partners for awards. It's important to understand exactly what's happening here: Delta is making its cheapest award space available to its own members and to partners on individual segments, but charging its own members more on the complete itinerary and not making that complete itinerary available to partners. The reason the Alaska workaround works is that Alaska is willing to search for each leg individually in a multi-city search, and then price the entire itinerary according to its own routing rules, which make it a valid one-way itinerary. Flying Blue doesn't let you construct Delta itineraries online because your final destination must be your originating airport. So Flying Blue isn't the key to unlimited cheap flights on Delta. That doesn't mean it's useless! On the contrary, it's going to be one of my first stops along with Alaska, British Airways, and United, each time I start planning a new trip. The search engine makes it easy to see at a glance whether there are award seats available, and if there are, they will usually be among the cheapest, not because of their great award chart or their low fuel surcharges (on the contrary, they have a fairly standard award chart and pass along fuel surcharges to customers), but because the miles themselves are so cheap when transferred from a Chase Ultimate Rewards account. To make the same point another way, a redemption of 12,500 SkyMiles manufactured with a Delta Platinum American Express card costs $188 in opportunity cost ($8,929 manufactured on a 2.105% cash back card), while a 12,500-mile Flying Blue redemption costs just $125 in Ultimate Rewards points: a 33.5% discount. I don't expect those redemption to be very frequent — but I do expect to make them each and every time the opportunity presents itself!